Technological advances mean finding new ways to interact with our world, and Royal College of Art graduate Yen Chen Chang has accomplished that with a project called analogRead (Knitted Sensors). The project consists of three objects that are activated by interacting with knitted conductive yarns. 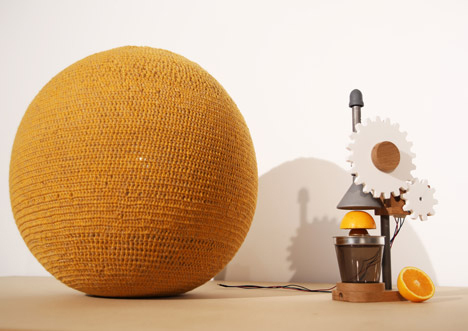 The Squeezy Juicer, pictured at top, is a citrus juicer that comes to life when a huge orange knitted ball is rubbed or squeezed. The yarn used to knit the ball is made of 80 percent polyester and 20 percent stainless steel; when it is stretched, moved, rubbed, squeezed, petted, other otherwise interacted with, it creates a small electrical charge. Harnessing those electrical charges can translate into providing small amounts of power to objects like the juicer, or like the fan pictured above. 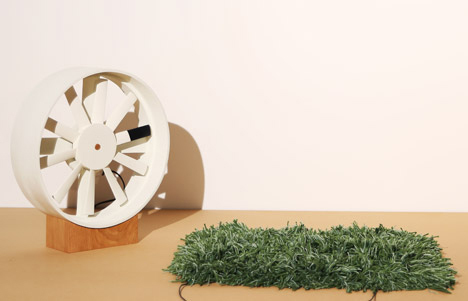 The Touch of a Breeze is a small fan that is powered by petting a small patch of green carpet. The carpet is meant to evoke the image of a patch of grass, and when you play with the grass a gentle breeze blows. The harder you rub the “grass,” the harder the “wind” blows. 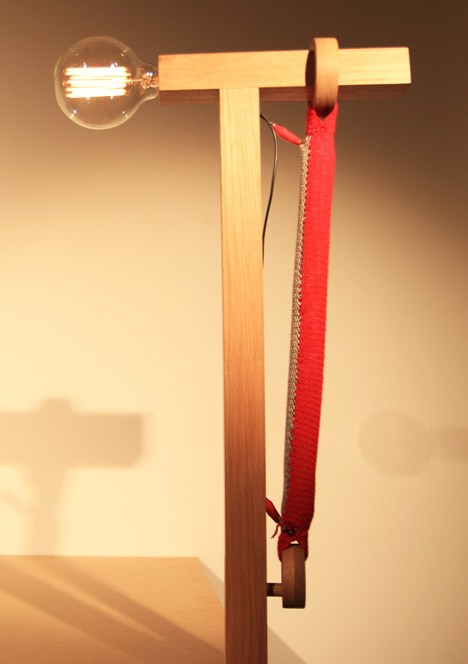 Finally, the Tension Lamp utilizes conductive yarn to power a light bulb. The harder the dangling knitted rope is pulled, the brighter the light bulb shines. According to the designer, these prototypes were developed to demonstrate how our interactions with electronic objects can be altered by re-imagining the roles of household items in our lives. See more in Art of Tech or under Technology. June, 2014.